Pg 97 - Oh these are deliciously more ish ! 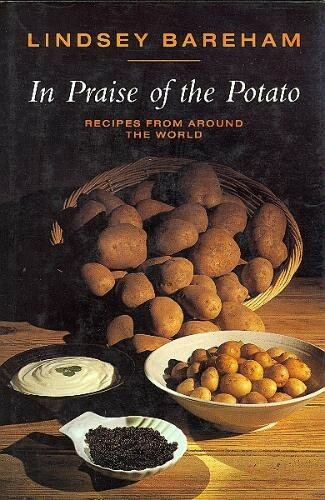 A collection of potato recipes from all over the world, including history, lore and legend, this book describes all the cooking methods - boil, steam, mash, roast, saute, deep fry and au gratin - and numerous unexpected variations on the themes. Then, turning to potato recipes, the author includes an exhaustive collection of appetisers, soups, salads, lunch, side and dinner dishes, ideas for using leftovers, stuffings, sauces, buns, cakes, breads and drinks. Lindsey Bareham has written "Mood Food", "The Time Out London Shopping Guide" and "The London Ethnic Restaurant Guide". Supper Won't Take Long: Favourite Recipes from the "Evening Standard"